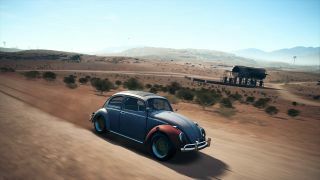 One of the most fun parts about Need For Speed Payback is finding the derelicts – five old wrecks you can fix up to standards way higher than any other car you'll find in the game. Each of these derelicts is unlocked by completing certain missions, after doing which you’re awarded postcards with vague locations as to where the vehicles and their parts are located. If you don’t have the time to comb the whole map for each and every clue, we’ve got you covered – every derelict and every part, all discovered for you here. Some basics to note: all cars require you find the chassis first, then any of the four parts in the order of your choosing. Your scanner will highlight when you’re near parts, beeping faster as you get closer and slower as you get further away – you’ll know when you’re in the rough area. Almost all of the parts are located in off-road areas, so you might want to use an off-road vehicle on your hunt. It’s not a prerequisite – any type of car can be used, it just makes it a bit easier to use the vehicle type for the terrain. Oh, and almost all the parts require a jump to be hit before you can get to them – there’s no cheesing your way through rocky outcrops as a shortcut. And, above all, it’s fair to point out: it’s hard to miss the derelicts when you’re looking. Hopefully we can make it a bit easier for you with our Need for Speed Derelicts guide. Once the chassis is in your possession, the four parts are ready for the taking. Look for a jump just off the road – a fire next to the part is the big hint here. Look for the abandoned mine, or mill, or whatever it is – drive through the middle and over the ramp, and you’ll land at the next part. Look for this jump, after you climb a nearby hill just off the main road and you’ll hit the part you’re after. This one’s easy – a jump just off the following nearby corner and you’ll land right at the part.